The first lithium ever found in a star explosion was pinpointed in this bright nova (center). Nova Centauri 2013, the exploding star, was captured in July 2015 by the New Technology Telescope at ESO's La Silla Observatory. The brightest nova of the century blasted lithium into space at 1.2 million mph (2 million km/h), new research reveals, cracking a long-standing mystery about the chemical balance of the universe. Nova Centauri 2013 materialized in the sky in December 2013, caused by a huge nuclear explosion on a white dwarf star. This formed a new point in the constellation Centaurus, visible to the naked eye. Now, new measurements from the European Southern Observatory's (ESO) La Silla facility in Chile reveal that the explosion is ejecting the element lithium, the first time that element has been seen in a nova system. This may help explain the topsy-turvy lithium distribution within stars, according to ESO officials. "Understanding the amounts of lithium observed in stars around us today in the universe has given astronomers headaches," ESO officials wrote in a statement. 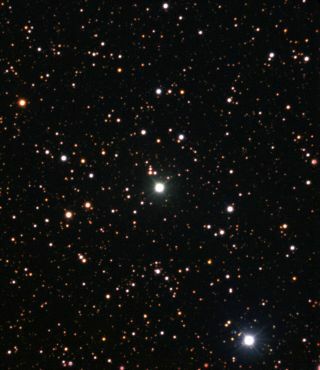 "Older stars have less lithium than expected, and some younger ones up to 10 times more." [Video: Lithium Found in Nova Blast] The amount of lithium ejected from Nova Centauri is small, less than 1 billionth the mass of Earth's sun. But the element's presence in the nova supports a hypothesis in astronomy that a particular class of younger stars could have been built partially from lithium shot out of older stars. This would explain the younger bodies' higher levels of lithium. Nova Centauri 2013 appeared in the sky alongside its two bright companions, Alpha and Beta Centauri, only recently. Here, Nova Centauri 2013 appears behind the silhouette of ESO's La Silla Observatory. "It is a very important step forward," study co-author Massimo Della Valle, from INAF–Osservatorio Astronomico di Capodimonte, Naples, and ICRANet, Pescara, Italy, said in the statement. "If we imagine the history of the chemical evolution of the Milky Way as a big jigsaw, then lithium from novae was one of the most important and puzzling missing pieces. In addition, any model of the Big Bang can be questioned until the lithium conundrum is understood. "Della Valle and another co-author, Luca Pasquini, an astronomer at University of Bologna in Italy, have been searching for traces of lithium in novas for over 25 years, according to the statement. Nova Centauri 2013 falls within the red circle on this chart, in the constellation Centaurus. Since the nova erupted in 2013, it has been visible without a telescope. The lead scientist, Luca Izzo from Sapienza University of Rome and ICRANet, is excited too, although newer to the chase, he said in the statement: "It is very exciting to find something that was predicted before I was born and then first observed on my birthday in 2013!" The research is detailed in the July 20 edition of The Astrophysical Journal Letters.